I just finished this last night and thoroughly enjoyed it. The concept that drives the story is very cheeky and fits perfectly with the evidence any of us can gather from our daily interactions online and in the real world. It's not short on "dad" humour that takes the edge off what could otherwise be quite confronting at times. In many ways it feels quite similar to Flash Forward, which is high praise as I enjoyed that book just as much as this one, although Quantum Night has big philosophical and psychological aspects that set it apart. The story is intricate enough, with our protagonist's past gradually revealed to us through flashbacks and insights from his treatments, but it never becomes bogged down or confusing. I find Robert J. Sawyer's style makes for very easy and enjoyable reading so I ate this one up in less than a fortnight. The characters are mostly likeable (most of the time) and the one really bad guy is only briefly involved in the story. That said, all the good guys do questionable things but that is part of what makes it so engaging. If there was one aspect that bugged me a little, it was that the background of general unrest -widespread rioting, etc. - seemed a little forced. But that was a minor gripe that didn't spoil anything. 4.0 out of 5 starsWhat if you could make 60 percent of the human race into better people -- at the cost of turning the best 15% into sociopaths? Suppose that a neuroscientist found a reliable physical method for identifying sociopaths. Suppose that another neuroscientist found a way of measuring the quantum state of an individual’s brain. Suppose that together, they discovered that for every 1 thinking, empathetic individual in the world, there are 2 psychopaths and 4 psychological zombies (people who don’t have inner lives and consciences, but spend their lives following and imitating others, a la “mob mentality”). That’s the premise of this book. It’s an interesting one, and the author has done seemingly strong research into psychology and quantum physics to provide a solid basis for the novel; I'm hardly an expert in either, so I can only say that I found it believable enough to enjoy. 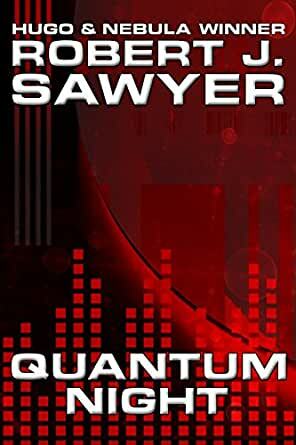 Sawyer’s books tend to range widely in quality from excellent to good to occasionally crap. I’d put this one in the “very good” range. The premise is interesting, and the plot is well done. I was much less enamoured of the unecessary frequent references to pop culture ("Taylor Swift", "Classical Gas"), which will, I suspect, make the book seem very dated 10 years from now. Fans of speculative fiction works about quantum physics will probably enjoy this. As always, Robert Sawyer delivers. I made a real point to avoid reviews or anything even remotely about this book before I read it. It's set in the near future, bouncing back to newly-discovered memories of the main character, Jim Marchuk. The story follows Marchuk as he makes discoveries about both people in general (why are some people psychopaths? Why do others seem to simply follow the crowd?) and about himself specifically. I'm not a good reviewer, so I can only tell you that the book held my interest completely, all the way through, and left me lying awake after finishing it, wondering where I would fit in, in this world of quantum states of consciousness. Am I what I would like to think? One reviewer noted that politics had intruded into the story, and he found that distasteful, but in this story, politics are virtually required... the world can be greatly impacted by the actions of a very few, and how that could change for the better or worse was an integral part of the story. My best indicator of whether a book gets five stars is whether I will read it again. This one will be on my required repeat reading list, for various reasons. Plus for the first time, Sawyer added a bibliography. Based on the questions that arise in this book, some of those things will be added to my reading list as well. Well done, Mr. Sawyer! Well done! I'll try to make this review useful for potential readers: as a thoughtful old-fashioned hard-ish sci-fi it is very good, moves at a brisk pace, is never boring, and one plot twist genuinely surprised me. Characters are strictly one-dimensional, but that's the point. Which brings us to the major themes: whether one is a psychopath, mindless drone (most of us, apparently) or an enlightened thoughtful being is largely pre-set on a quantum level. Now, what if one could switch these states? En masse? Would it be ethical under this or that series of circumstances? The book essentially develops a thought experiment reaching its logical conclusion. Why just three stars? Well, the novel is set in (very) near future, and the author immediately gets entangled with current politics. It doesn't even matter if it's left or right, it's just a little too current and does not belong to a sci-fi book. The usual annoying "protagonist divides humankind into deserving few and undeserving many, and promptly puts him/her self in the former camp" trope applies, only this time the protagonist is even more annoying than usual. Regardless of your political leanings, this aspect of the book is cringe-inducing. Problem number two: the ending hinges on a bunch of truly amazing coincidences (even for a quantum universe), and the big scientific idea / break-through in the end would be obvious to anyone capable of doing 3rd grade math. A little disappointing. This said, it's a good read, and the mystery plot (which starts the events in the book) is actually very well done. Some psychology anecdotes and thought experiments are interesting and new to a layman (well, at least this layman). And it is indeed thought-provoking. Cautiously recommended. 3.0 out of 5 starsAverage Read for this Robert J. Sawyer Fan! Sawyer wrote this novel in an overly political way while through in some smattering of science and pseudo-psychiatric theater to create a simple world where people are one of three categories. Interesting premise, but since people are quite complex you can’t really categorize them that way. That’s one problem with the psychiatric mind is that it is more interested in labeling rather than curing the problems of the mind. Jim searches for his missing memories and just as in an old pulp fiction novel he finds those six months and is shocked by what he has done. Solution: Change the course of humanity upward to avoid World War III. Girlfriend only cares about her daughter becoming a philosophical zombie (lots of these terms peppered throughout the book) and so screw humanity, let me save my daughter! Philosophical conundrums abound in this book. Should we save all of humanity for the sake of one? Or should we sacrifice the one for the common good, even if you become a real jerk in the process? I’m sure Quantum Physics can be used for better things that screwing with the minds of the 7 billion peoples of Earth. Sawyer tends to politicize the whole thing – Putin, a US President with expansion ambition annexing Canada, a near start to World War III and three people who use a billion dollar device to change the course of humanity at the cost of a life. Sounds too good to be true. Sawyer’s last two novels have not be on par with his earlier novels, and I’m not sure why. WWW Trilogy was cool. Loved Fast Forward and others.